Fighting a Traffic Ticket in California Has Been Simplified and Improved with the Release of the GetDismissed Mobile Application Version 2.0. GetDismissed.com, has released version 2.0 of its GetDismissed traffic ticket fighting web service and mobile application. GetDismissed is the only web service and mobile application in California that allows users to take a picture of their driver’s license and traffic ticket, answer a few questions about their traffic ticket and automatically generate all the defense documents required to fight a California traffic ticket by mail using a Trial by Written Declaration. We have sought out a way to simplify the ticket fighting process in California in order to remove the frustration associated with fighting a ticket in court. Our goal was to create an easy to use system that alleviates that frustration. GetDismissed.com, has released version 2.0 of its GetDismissed traffic ticket fighting web service and mobile App. The App is free and available through the Apple Store and Google Play. GetDismissed is the only web service and mobile application in California that allows users to take a picture of their driver’s license and traffic ticket, answer a few questions about their traffic ticket and automatically generate all the defense documents required to fight a California traffic ticket by mail using a Trial by Written Declaration. There are over 24 million drivers in California that get issued about 5.2 million traffic tickets every year. Most people do not fight their traffic tickets because the process is so frustrating and takes up so much time. Currently, only about seven percent of those tickets are ever contested. GetDismissed has changed that. 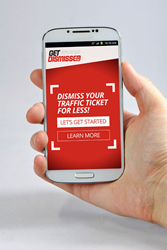 With the GetDismissed App, you do not need to go to court or hire any expensive attorney to fight your traffic ticket. GetDismissed has completely reinvented this category by offering a cheaper, more efficient option. GetDismissed.com, located in Westlake Village, California, was founded in 2014 by Steven F. Miller. The GetDismissed.com service is built on a platform that has assisted thousands of Californians with quickly and inexpensively filing the necessary paperwork to contest and dismiss their traffic tickets through the Trial by Written Declaration process. The GetDismissed App, available through the Apple Store or Google Play, is Mr. Miller’s solution to creating a very inexpensive, fully automated, and user-friendly online service for California drivers to submit their traffic ticket information, process the necessary documents and submit the case to the courts. It’s That Simple.